For most meeting planners, working with a CVB sales rep is a fact of life. Usually, after years of meetings and RFPs and site visits, by the time a meeting is booked the planner and the rep have formed a strong bond. However, like any relationship, there is always room for improvement! We’ve pulled together a list of best practices for working with CVB sales teams that you can use to surprise and delight all of the reps with whom you work. As one of our dedicated convention sales staff so aptly put it, CVB reps are like the conductor in an orchestra – we are the connection to everything in the city and in charge of the overall performance. We are able to look at the bigger picture for all your meetings, so help us help you by keeping in mind the following. First and foremost, tell us your history! This is more than just your peak rooms. Let us know: Where have you been? How was your experience in other cities? What have you learned from those experiences? Do you have any hot buttons or must haves? Be sure to outline your group profile. Are you double heavy? Is there a preference for warmer temps? It’s also helpful to know the health of the group. What does the future look like? How far out are you booked? Are you growing or shrinking? We also like to know up front what your decision timelines look like – Two months to short-list, site visit by summer, contract by end of Q4, etc. Additionally, make us aware if you are considering our city because of a local resource prior to a site, so we can ensure we connect you with the right entities and you get the most out of your visit. Essentially, just understand that there is no such thing as information overload when working with a CVB. Think of it like going to the doctor; the group history, habits and health are important. It’s easier for us to make recommendations when we understand all facets of your group. One last thing of note, please check with us about services we provide even if you’re unsure! We often find that groups think we just handle business downtown, but our work with various facilities and partners reaches far out into the suburbs. 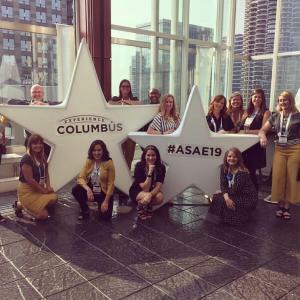 We do spend a lot of time working with groups who call downtown’s Greater Columbus Convention Center home, but we have great hospitality partners in the areas of Polaris and Easton and beyond as well. Get in touch with our energetic sales team today to find out how we can make your next meeting in Columbus a success.